Contour - the best you can get! Six different adjustments to suit all pilot sizes and flying styles. Beautifully made with so much attention to detail that the accompanying manual runs over 20 pages. 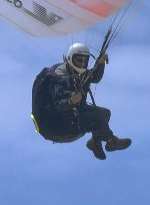 Extras such as dual lumbar support straps, seat tilt adjustment and ABS built into a neoprene fairing, mark this as a harness for the serious paraglider pilot. A carefully constructed outer shell and numerous pockets make it ideal for XC and competition flying. Used in conjunction with Apco's Airfoam Protection System and Side Protectors, it provides the best pilot protection available. 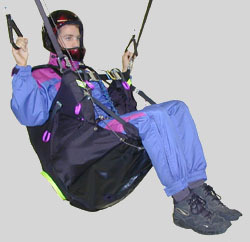 It is possable to order your Contour with many different options, either factory installed before shipping or added later yourself, including two different reserve parachutes, back protection systems and side protectors. Click on the links below to find details about pilot Protection and more.